The intent of this edit is NOT to create a better movie. Wrath of Khan already rocks!!! Instead, I set out to create an alternative, and hopefully, entertaining viewing experience. Wrath of Khan is probably hands down the best, and most popular, of the Original Cast Trek Movies. It has stood the test of time fairly well, with few weak/bad scenes and very little fat. I have often described it as a lean, mean, economical story machine. But after many, many viewings over the years, the thing I always found the most fascinating about the movie is the two main characters of KIRK and KHAN never actually physically meet through the entire movie. And that got me thinking, could a person still tell the same story by completely (or as much as possible) removing KHAN from the movie? Thus, a Fan Edit was born! THE SECOND FIVE YEAR MISSION BEGINS… Sins of the Past return to haunt Admiral James T. Kirk… A minor training cruise turns into a desperate fight for survival as an old enemy from Kirk’s past returns to extract his revenge. Entangled in this web of vengeance is an inexperienced new crew, a long lost son and a startling new scientific creation. A creation, that in the wrong hands, could become the most powerful weapon in the galaxy! Relive the adventure from an entirely new perspective! With the exception of the Opening Teaser, I have attempted to recut the remaining movie from the Point of View of Admiral James T. Kirk. Thus, the viewer experiences the adventure as Kirk does. The audience only learns details as Kirk learns them. Furthermore, the audience only sees or hears KHAN when KIRK is present. 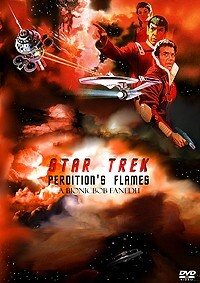 Along with flashback clips from the Original Series, TOS music/FX and a few other surprises, PERDITION’S FLAMES will be a fresh and enjoyable viewing experience for the Trek Fan who has watched WRATH OF KHAN on more occasions than they like to admit. – plus one or two other surprises! Let me start by the only thing I had a small issue with, the music. I did not think the blend between the original series music and the movie music works as well as the V'Ger incident. The Jerry Goldsmith score mix much better with TOS than James Horner, who crafted an incredible score. But still, it was not bad, only more apparent. One thing that could have been nice to do is when the Enterprise meets the Reliant for the first time, a ominous music starts right away. Since it's Kirk POV and he has no idea that this is a threat, the music could have started when Kirk says "This is damn peculiar...". This is just an idea. That being said, I LOVED this edit! I miss seeing Khan in a couple of scenes but the movie works nevertheless! You sense the presence of the enemy, even if you rarely see him. The Kirk POV really add to the intensity, in part because we cannot see or hear what Khan is saying or planning next. So we are experiencing what Kirk do, and that's the point! When Kirk finally meet his nemesis, the flashbacks to the Space Seed episode were absolutely genius and the choice of music was perfect!!! I really liked the timing of the flashback scenes during Kirk slowly getting up from his chair, totally surprised by Khan's appearance. The intent of this edit result in a even better pacing of the movie. I really love the original release but the judicious cuts help to remove some unnecessary fat, like Khan right hand man for example. Even if I didn't knew the story by heart, I felt that all necessary information were there to understand everything. I cannot express how much I was pleasantly surprised by the edit and my enjoyment seeing it!! There were two particular surprises for me at the end of the Mutara Nebula battle. First, I thought I was going to see Khan on the Reliant when he starts the Genesis device and deliver his final speech. Rather, Bob decided to keep the focus on the Enterprise crew, with a voiceover of Khan's speech, which is brilliant! Second, I was shocked to hear McCoy say "Jim, I think you better get down here...". I was so sure to see Spock sacrifice that it surprised me, as Kirk was surprised by McCoy. Finally, the Spock funeral was revised for a really emotional scene! The Inner Light track from TNG is one of my all time favorite and it's used here with great effect! The emotion cranks even higher with the inclusion of a couple of flashbacks of the original series. WOK is a great movie without a shadow of a doubt, but I can assure you that Perdition's Flame has now a place in my movie library, right beside the original release! GREAT FAN EDIT BIONIC BOB!! Wow. I quite loved this! Like a lot of other reviewers are saying of themselves, I am also not really a Trekkie, but I eventually watched all of the original series (no other ones--Pickard Who?) and I saw the original cast movies at home on VHS. So it has been a long time since I have watched this movie. Really didn't not like the opening "teaser". The movie actually starts 1 minute and 25 seconds later. It really just felt like a jumble of scenes/spoilers. This was the one and only thing I actually did not like about the edit, and it is easy to disregard it since it's at the beginning. I did have a couple of issues regarding the story though. There is some weirdness when Kirk beams down and sees his son and the scientist lady. It's clear there is some backstory that is missing. (Frankly, though not the intent of this edit, I wish that goofy dude was not Kirk's son. TMBTM managed to fix Indy 4's similar "cool guy/crappy son" issue. But I know that is not what you were going for here). I felt one or two more interior shots of the Reliant with Kahn would have been useful during the final battle scene, especially for more closure on the big villain's death. I know we'd be out of Kirk's POV, but just barely as we'd be seeing damage Kirk was inflicting. I think all the other removing of Kahn worked perfectly. The other issue I had was with Spock's death. There was no explanation at all for what really happened there. I mean, we can piece together what it was. Unfortunately being in Kirk's POV still doesn't give us Kirk's knowledge of the ship, etc, so I really would have loved to have gotten at least Scotty trying to stop Spock or something by way of explaining what killed Spock. All we know is he saved the ship, somehow, by doing something and now he's gonna die. I liked the montage at the funeral, I would have preferred washed out color instead of black and white, but that's just me. I think in the V'ger movie there were fewer fades to commercial, and I felt fewer was better, but that's no big deal. Overall, I am really REALLY enjoying these Star Trek edits! I am watching them in order, though this is the 1st one I have reviewed. Can't wait to watch the rest of them! Apparently, everyone loves wrath of Khan. It's supposed to be the film that saved star trek. I was born after the classic Trek era. I grew up with TNG. The first Star Trek movie I remember seeing in theatres was First Contact. This edit... well it made the film fun. The story moves more quickly, there is mystery and tension. Shatner seems like a great actor. What little we se of Khan makes him tolerable (even enjoyable). Also, the continuity problems have been amended. On the whole, a fantastic edit. My go to copy of WOK. There’s never enough time to watch everything… and man, are there loads of fanedits which I need to catch up on! Well, one wet Thursday evening I fancied a bit of Star Trek, and having only seen 2 of Bob’s Trek edits (of the first and fifth movies), I thought it was about time I watched “Perdition’s Flames”. Firstly, I really like the whole concept of what Bob has done with his TV series approach to the movies. The adding of the series sound effects, music and all the fade to black ad-breaks worked particularly well in “The V’ger Incident” (a few music level problems aside), and I’m pleased to say that the case for Perditions Flames is no different. In fact, as The Wrath of Khan always seemed to feel much like an extended TV episode anyway, the classic feel which Bob adds to this edit seems perhaps more like a perfect marriage of styles this time around. Indeed, it comes as no surprise that flashback footage to the actual TV episode, “Space Seed” is utilised when Kirk realises it is Khan who is attacking the Enterprise. What’s more, it’s nicely executed too, and to me the only aspect of this edit which would make it even better would have been to try and crop the image to 1.85:1 ratio. That being said, picture quality is good throughout and the sound editing this time around is more consistent with no varying levels to speak of. So, for picture and sound quality I would give this a solid 9/10. Great job Mr Bionic. In terms of the story, this was perhaps the most ambitious side of the edit, in that Bob tries to tell the story very much from the point of view of Kirk, meaning that we only ever see Khan when Kirk is also present in the scene. Initially I was a bit worried how this would work. After all, some of the best moments in the film are when Ricardo Montalban is chewing up the scenery, but for this edit and its intentions, it works very well. That being said, when it comes to the heroic exploits of a certain Mr Spock and the consequences thereafter, I did feel that there was a little too much missing, even though I fully understood Bob’s intention to keep things firmly fixed on Kirk’s point of view. The use of flashbacks and new music during Spock’s send off though does not work as well for me; not badly executed, it just didn’t seem to fit comfortably for me. On the visual and audio front, the editing is more or less flawless and as already mentioned the audio side in particular is an improvement on Bob’s first Star Trek edit. So, Visual editing would get 10/10, audio 10/10. Enjoyment is, as with all Bob’s edits, the aspect which shines through the most. You can tell the amount of enthusiasm and love which he puts into the edit and I was thoroughly entertained from start to finish, as easy 10/10 for me. Overall then, Perditions Flames continues and in many ways improves on the good work started with The V’ger Incident. If you want to see Star Trek II from Kirk’s perspective then this is the perfect way to do so and you will have a blast; that I can guarantee.